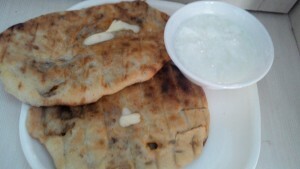 Kulcha is a kind of bread made of maida . They are very famous in Punjab and Delhi. Punjab especially amritsar is very famous for its stuffed kulchas. Maida roti is filled with spicy potato and onion stuffing and baked in tandoor or tawa. My mother used to add anardana also in stuffing and this will add a new aroma to it. 1.In a bowl add all ingredients of making dough. 2.Mix all ingredients with hand and by using water knead a soft and smooth dough. 3.Cover the dough and keep it aside for 3-4 hours. 4.Boil potatoes, peel and mash them. 5.Add onions, ginger, green chilli, salt, red chilli powder, garam masala, amchoor, coriander powder, coriander leaves, and mix them well. Add 2 tsp oil in a kadai and fry whole stuffing for 3-4 minutes.Kulcha stuffing is ready. 6.Make equal sized balls from the dough and also make potato balls of same amount as of dough. 7.Take one dough ball and roll it into a diameter of 3 inches. Put potato mixture in between and seal all the edges. 8.Dust it with dry maida and with rolling pin roll it into diameter of 6-7 inches. 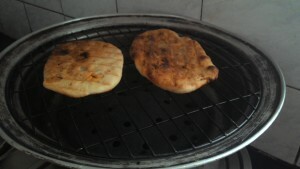 9.Now place this kulcha on hot tawa or gas tandoor . Flip the side by applying ghee or butter and cook from other side. Cook it till both sides turn brown in colour. Apply butter in between cooking both sides. 9.Now place the kulcha in plate. Spread some more butter over it and enjoy this soft and little crunchy amritsari kulchas with punjabi chole or curd or imli chutney. This entry was posted in Anupama Magic, Main course recipes and tagged Maida dishes, potato dishes. Bookmark the permalink.